Superior Cleaning and Restoration Inc. have been taking care of all the carpet and rug cleaning needs for the people of Corona for years. Our team of skilled professionals employ hot water extraction systems that are truck mounted and couples them with the best known cleaning products that are also eco-friendly. Our methodology is recommended by leading carpet manufactures in the industry. You can rest assured that your carpets and rugs are in the best hands possible. Being the best at what we do, we come fully prepared for any cleaning situation, be it the removal of stains left by pets or getting rid of musty odors emanating from carpets and rugs. Most are aware well aware of the major health hazards that are posed by the occurrence of mold and mildew. We can assist you with the prevention as well as remediation processes that you might need assistance with. It is imperative that you take measures so that the air quality of your home can be as clean as possible. Another handy product offered in conjunction with our services is the Teflon Carpet Protector. This value-added service helps you reduce the wear and tear of your carpets and rugs in areas that witnesses a heavy inflow of usage. It can also help in protecting them against any oil spills, pet stains and grease stains. If you need assistance with anything or have any query that you would like addressed, our knowledgeable staff is at your service, don’t hesitate to give us a call. 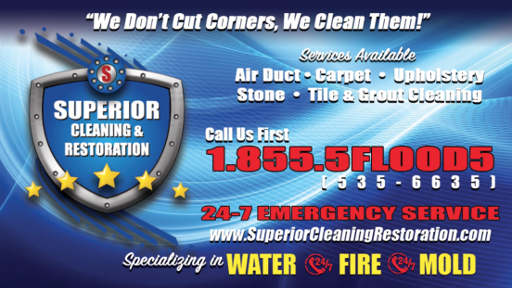 At Superior Cleaning and Restoration Inc. we try to achieve perfection and ensure that you get the best results the first time for a low price.